National Law Institute University (NLIU) is a law school and centre for research located in Bhopal. 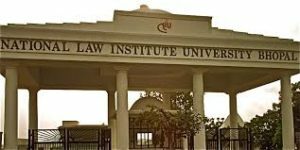 Established in 1997 by the State of Madhya Pradesh, it is one of the first three law schools to have been established under the National Law School system. The university launched its first academic programme in 1998, with Indian jurist V.S. Rekhi as the Director. Recognised by the Bar Council of India, the university admits 100 undergraduates each year through the Common Law Admission Test, who complete 15 trimesters before being awarded a combined B.A., LL.B (Hons.) degree. The post-graduate course offered at the University is the LL.M. degree. The university is devoted to the use of modern methods of teaching and evaluation. It emphasises the advantages of learning through small groups in a clinical setting. The year is divided into three trimesters of 70 working days each. The lectures are accompanied by extensive teaching material prepared and consistently revised by the faculty. Use of audio-visual equipment, small group sessionals, computorials, externships, internal moot courts, simulation and other learning by doing techniques form the core of tutional arrangement. The student is expected to write one paper in each course later followed by substantive dissertation in seminar courses. The cumulative effect is to make for an intensive environment of learning where the teacher and the taught co-operate in inquisitive exploration. The co-curricular activities of the university are regulated and overseen by the various committees which are in existence. Various committees handle the main co-curricular activities taking place in the university. All the committees are run by students with a faculty in-charge. They have their own constitution and the students have been given the independence to formulate the working mode of these committee.